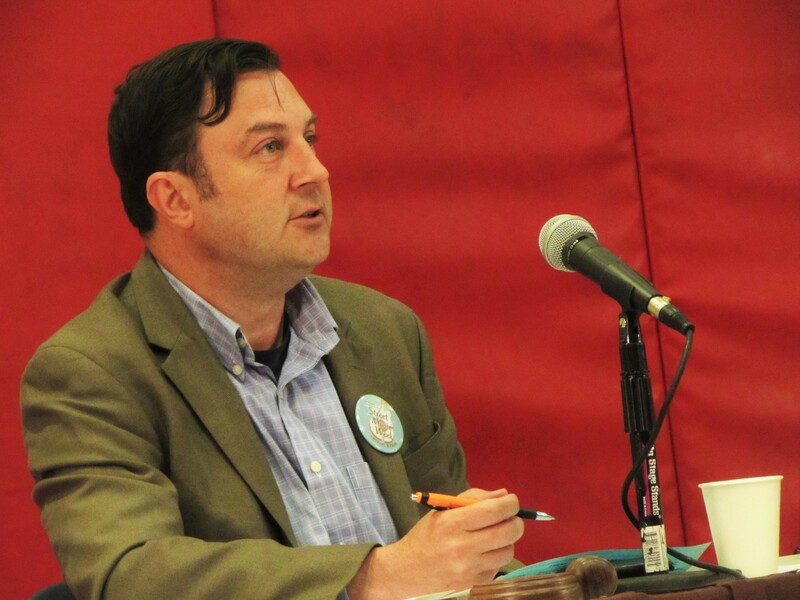 City Council President Ben Stuckart doesn't just plan to run for mayor. He's effectively already running. Local electoral races this year are just beginning to heat up, but City Council President Ben Stuckart is already looking ahead. Not to 2017. Not to 2018. To 2019. To run for mayor. According to Washington State Public Disclosure Commission filings, Stuckart filed to run for mayor on April 19 of this year. Mark it down now. Ben Stuckart has thrown his hat into the ring three years in the future. And don't expect him to change his mind unless something drastic happens. "It’s a sure thing as you can get," Stuckart says. These campaigns, he says, have to start early. "I think I’m going to have to start on fundraising in early 2017," Stuckart says. "Because I think it’s going to take quite a bit." He's following in the footsteps of Mayor David Condon, who began raising money for his reelection campaign shortly after taking office in 2012. Stuckart's proud of the work he's accomplished in the past four and half years. "I believe I’ve been a national leader on the oil train issue and the coal train issue... I think I’ve been one of the most successful legislators in the last 15 years in Spokane. I’ve shown I can maneuver around the city well," Stuckart says. "Now we [need to] grow our economy to help everybody." Last year, plenty of speculation had percolated over whether Stuckart would challenge Condon. But in January, he officially ruled that out, suggesting he liked what he was able to get done from the legislative side. Instead, Condon faced the liberal Shar Lichty, a relative unknown who was immediately controversial for supporting Envision Spokane's Worker Bill of Rights, a proposal Stuckart ardently opposed. But Stuckart says he doesn't regret declining to run for mayor last year. "It was the right decision for that time, absolutely. My dad was dying," Stuckart says. "I made the final decision not to run at the end of December. My dad passed away on Dec. 28. I was not in the place to be running a twice-as-expensive campaign as I ran." Ironically, despite the right-leaning Condon and the left-leaning Stuckart's very different ideologies, they walked away with almost identical landslide victories. with 63.3 percent of the vote. Since then, both figures have become more controversial. Condon has been mired in controversy over how he handled the allegations and subsequent ouster of Spokane's police chief, with Stuckart leading the chorus of critics. And Stuckart passed a sick-leave policy ardently opposed by several conservative business groups. But both the mayor and the city council president positions are capped at two terms. Condon's last year as mayor, no matter how popular he is, arrives in 2019. So does Stuckart's last year as city council president. Stuckart faces a choice: run for a regular council position, run for something else, or retire back into the private sector. "I think that would be a downward trend to go from president to just a slot on the city council," he says. "If I ran for mayor and won, I could use what I’ve learned in the city council. Some of the frustrations I've had dealing with the mayor’s office, I could turn that around." As an example, he cites the council and the mayor's office operating off of separate strategic plans. If he were mayor, he says he could align his plans with the council. He expects his opposition in his race for mayor to be quite fervent. "I think I will have some fairly significant outside forces trying to defeat me," Stuckart says. "I have a number of people that look at me like Hitler online." City Councilwomen Lori Kinnear and Karen Stratton have also already filed for the 2019 race. And Kinnear already appears to have a donation for 2019: $500 from the Washington State Association of Realtors PAC.